The Bombon area was the most vibrant according to de Loarca's narrative. Mention has already been made in the second chapter of the Spaniard Miguel de Loarca as this narrative sought to get a bearing on the coastline of Tulay or Tuley. For this chapter, we return to his relation or narrative to get a better grasp of how things were in Batangas in the first decade of Spanish colonisation in terms of population and governance. De Loarca was among the earliest conquistadores to arrive in the Philippines; and he even took the opportunity to travel to China. Miguel López de Legaspi, the first Spanish governor of the country, in 1572 awarded him with an encomienda in Oton in the island of Panay1. His 1582 narrative was a comprehensive description of the country and the era and also included something akin to census results. While allowances have to be made for the accuracy of these results, the numbers provided in de Loarca’s narrative give context to history as it unfolded and as it was being recorded. Information on what would become the Province of Batangas was part of a chapter de Loarca wrote on the island of Luzon, which he described as “thickly populated and well-provided with rice and gold-mines.” Of course, thickly populated, in the mid-sixteenth century, would be no more than a miniscule fraction of modern day Philippine population counts. He described the region directly south of Manila as fertile, well-provisioned and populated by Moros who were “instructed in that faith by those of Borney.” He added that this “same race of Moros have made settlements as far as the villages of the Batangas” and even farther south in the islands of Mindoro and Luban (Lubang). Of what would eventually become the Province of Batangas, de Loarca first made mention of the villages of Tuley, which would be the stretch of coastline from present-day Calatagan to Nasugbu. According to him, these villages were direct properties of the King of Spain, which meant that tributes went directly to the crown instead of to an encomendero. Balayan, de Loarca wrote, was a corregidor; but in most likelihood what he meant was a corregimiento, a geopolitical subdivision that was jointly ruled by a direct representative of the crown and the regidores or councillors. Hence, the term corregidor for the crown’s representative, a co-ruler of the subdivision with administrative and judicial powers that emanated from the king himself3. In the case of Balayan, which at the time was an encomienda with 600 men, the corregidor in most likelihood jointly ruled with the encomendero and, according to de Loarca, received a salary of 150 pesos. 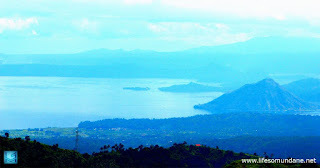 De Loarca was sparing in his description of Bombon, the area around what is presently known as Taal Lake. He did state that the population of the encomienda, originally granted by de Legaspi to Martin de Goite, was 3,400. This figure seems to give credence to Francisco de Sande’s complaints that encomiendas had been indiscriminately distributed even when the lands had not been properly explored. In a previous chapter, it was already mentioned that de Goite was granted a repartimiento of 8,000 natives. Still, the population of 3,400 given, when compared to others that de Loarca mentioned, tells us that the Bombon area was the most vibrant among the lands that would one day become the Province of Batangas. Despite the threat posed by volcanic eruptions, the population would have been sustained by the bounty from the lake along with the soils enriched by these eruptions. Chroniclers of de Goite’s exploratory voyage in 1570, in fact, described the land as well-tilled. Meanwhile, the villages in what de Loarca referred to as the Batangas district – likely the area close to what was then the pueblo of Batangas – had a population of a thousand and belonged to an encomendero. The encomiendas of Bombon and Batangas, he said, were under the jurisdiction of an alcalde-mayor4. The latter was similar to the corregidor in that he performed both administrative and judicial functions under the name of the crown. By the eighteenth century, the position of alcalde-mayor had evolved into that of the municipal mayor and had completely replaced the corregidor. De Loarca then proceeded to describe several villages that were part of a vast encomienda which spanned the southern coast of Luzon. First was that in the “river of Lobo,” three leagues along the coast from Batangas, which was then populated by a hundred Indians. Another two leagues from Lobo was Maribago, where de Loarca said there were gold mines. Was he referring to Malabrigo, a present-day village of the Municipality of Lobo and more than four miles from the present-day town centre? Maribago, he said, was also populated by a hundred Indians. Then he mentioned the village of Biga, which had a population of 150 at the time. There is another present-day village of Lobo by the same name which is roughly six miles (or roughly two leagues) from Malabrigo and very close to the coastal area of Laiya in the Municipality of San Juan. Finally, de Loarca mentioned the village of Galvan (Galban in other Spanish documents), which was in present-day San Juan, with a population of 150 Indians. 3 Corregidor (Spanish Government Official). Online at Encyclopaedia Brittanica. 4 Alcalde (Spanish Government Official). Online at Encyclopaedia Brittanica.